I assumed Mountain Boogers were a universal concept. Every time I travel to the mountains I get way more boogers than usual. Easily ten fold my normal booger production. When I went searching for their cause I discovered I was wrong. 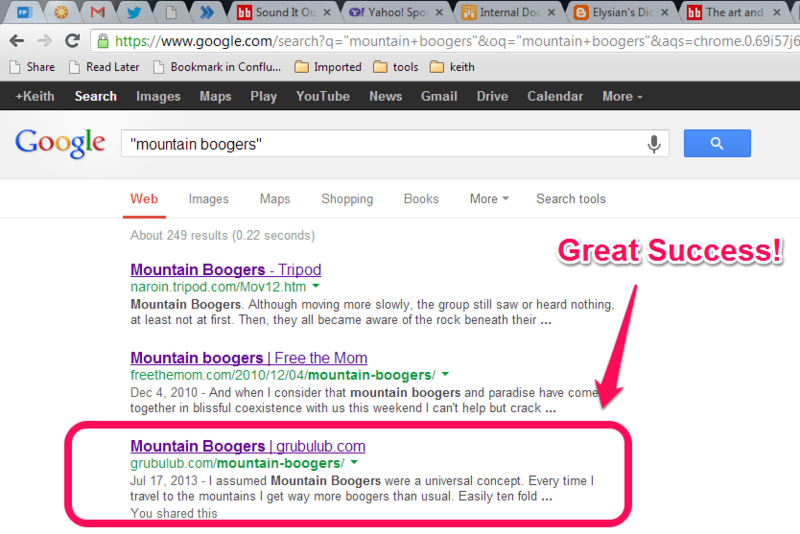 I could find very little information on the term “mountain boogers,” let alone their cause. So this post is mostly an attempt to claim a spot in the Google search results for “Mountain Boogers.” Yahoo Answers has a likely explanation of their cause. It’s what I assumed: lower humidity causes more boogers. Yahoo Answers again came through with an explanation of why the mountains tend to have lower humidity. I suspect my increased outdoor activity when I travel to the mountains has some effect as well with more dust and pollen making its way into my nose. This brings up a couple questions. Do you get more boogers in other dry environments? Are there desert boogers? Google doesn’t have much on that either. Do people who live in the mountains adapt and have less boogers than visitors? Clearly more research is needed. Please comment with your mountain booger experience. Consider this post your mountain booger support group. Let’s discuss all things mountain boogers. In conclusion, mountain boogers. July 17, 2013 in Health. I just googled “mountain boogers” and came across your blog. I had the exact same experience!!! I have not much more to add as you covered it pretty darn well. I most definitely have been experiencing desert boogers since I moved here from a rather humid climate… its been awful, going to start pumping my house full of humidity. Just came out to the Rockies for a few days of backpacking. The boogers have been intense to say the least. I kind of assumed it had something to do with dust, pollen, and dry air so I’m glad to see their are others who have the same thoughts on it. Stay strong. You’re not alone. I just came back from a weekend in the San Bernardino Mountains and I have an excess amount of boogers! Mind I have been back for a week already!!!! I have more boogers and they are bloody. Same experience with the arid climate. Comin’ atcha from a really awkward and shameful booger production factory in the Chihuahuan desert.